For college hockey fans, the most exciting time of year is here. As we prepare for the regional tournaments that will precede this year’s Frozen Four in Buffalo, we decided to give our takes on this season’s title battle. This year’s field promises an exciting tournament, with a fresh group of teams battling it out for college hockey’s highest honor. The tournament will not feature many of the traditional powerhouses. Boston College, Boston University, Michigan, Minnesota, North Dakota, and Wisconsin all missed out on this year’s big dance. Arizona State is headed to the national tournament in their fourth season as a Division I program. Photo courtesy of Sun Devil Athletics. Instead, several programs are making their NCAA tournament debuts. Arizona State is the first independent team to reach the national tournament since 1992 in just their fourth season as a Division I program. American International, who had never posted a winning record in Division I until this season, is also getting its first shot at the tournament. Meanwhile, the ECAC will send 4 teams to the tournament for the first time since the league split to create Hockey East in 1984. Cam Hasbrouck: St. Cloud State has been at or close to the top of college hockey’s rankings for the entirety of the season, and comes into the tournament as the No. 1 overall seed. While it isn’t always fun to bet on the highest seed, I’ll take the Huskies to advance out of the West Region. The Midwest Region poses some interesting matchups, but once again I expect the top seed in the region, Minnesota Duluth (ranked second overall), to move on to the Frozen Four. The Bulldogs are looking for back-to-back national championships after claiming last year’s title. A talented and deep defensive corps and a solid goaltender in Hunter Shepard helped Minnesota Duluth claim the NCHC tournament championship this season, and they’ll look to continue adding hardware should they advance to the Frozen Four. Out of the East Region, I’m expecting the No. 2 seed, Northeastern, to move on to the Frozen Four. Northeastern defeated Boston College twice to grab the Beanpot and Hockey East tournament championships, thanks largely in part to goaltender Cayden Primeau. The Canadiens’ draft pick won the MVP in both tournaments, and boasted an impressive .936 save percentage (SV%) this season. As for the Northeast Region, I expect Massachusetts to continue building on their historic season with a trip to the Frozen Four. The Minutemen won their first regular season Hockey East title this season. Their quick and dangerous forward group will keep opposing defenders busy, and Hobey Baker finalist Cale Makar will be a constant threat from the blue line. Drew Johnson: I think the Frozen Four will be St. Cloud State vs. the UMass and Northeastern vs. Quinnipiac. St. Cloud and the Minutemen have been powerhouses all season and, while there are one or two teams in their respective regions that will pose a challenge, I think they’re up for it. Northeastern and Quinnipiac have also been strong contenders throughout the season. I feel as though Northeastern has the ability to get by the opponents in their region despite being pinned against Cornell in the first round. Cam Hasbrouck: Despite being booted from the Hockey East tournament by Boston College, Providence received an at-large bid to the NCAA tournament. Although they fell short in the postseason, the Friars are a difficult team to play against all around and will pose a threat to the No. 1 seed in the East, Minnesota State. Despite being the lowest seeded team in the East, the Friars will be playing what will essentially be a home game in Providence, Rhode Island. The Friars has been in this spot before. In 2015, Providence slipped into the tournament as a No. 4 seed in, you guessed it, the Providence region, and went on to run the table for a national title. Don’t be surprised if they upset Minnesota State and punch a ticket to the Frozen Four again this year. Drew Johnson: Quinnipiac is my dark horse this year. While they have been in the national championship conversation for most of the year, they have a difficult road ahead. 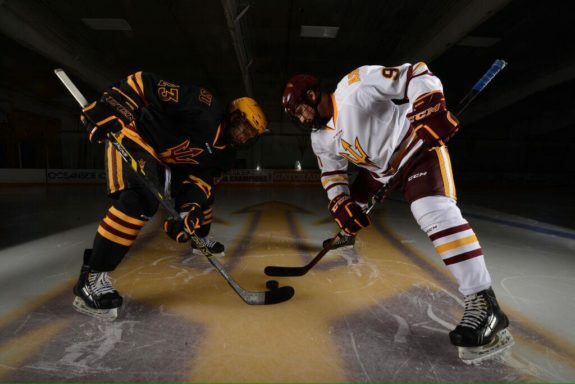 They have to first skate by Arizona State who has been a tough customer for teams across the nation. Then they will likely come face to face with Minnesota-Duluth. While it will be an uphill battle, I think the Bobcats will be hungry and ready after losing two straight to end the regular season. Cam Hasbrouck: Despite being the top-ranked team in the country, St. Cloud State was beaten by Minnesota Duluth in the NCHC championship to snap a 13-game unbeaten streak. They’ve also had a recent history of heartbreak in the national tournament, being bounced in the first round in each of the last two seasons. They’re a team that knows heartbreak, and they’ll be eager to avoid it. I expect the Huskies to bounce back from their devastating loss in the NCHC championship. They’re hungry for hardware, and I believe they’ll get it. St. Cloud has a complete team up and down the roster, although there is some concern as to whether star forward Ryan Poehling will play after being injured in the NCHC semi-finals. 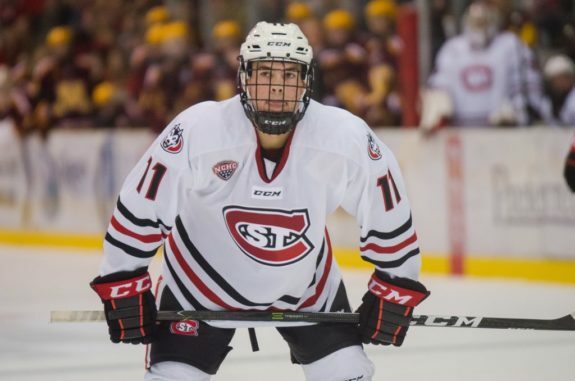 Even without Poehling, the Huskies will be a tough matchup for any opponent. I expect they’ll take home their first national championship in program history. Drew Johnson: I think Northeastern will take the crown. They won both the Beanpot and Hockey East Championship this year. The Huskies also have a slew of players who have come up clutch in big games this season, and there is no evidence present that we shouldn’t expect more. Tyler Madden always seems to be a threat despite being a freshman, but the real key will be the play of their goaltender Primeau. Cam Hasbrouck: Massachusetts’ Makar is my player to watch in this season’s tournament. The sophomore blue liner’s 46 points ranked fourth in the nation and made him the first defenseman to lead Hockey East in scoring since 1999. A Colorado Avalanche draft pick, Makar was a unanimous Hockey East first team selection. He’s a smart player on both ends of the ice, and he’ll make a big impact for UMass in the tournament. Drew Johnson: Primeau is in the running for the Mike Richter Award for best goaltender in the nation thanks to his 25-9-1 record, 2.00 GAA and .936 SV%. He stood on his head throughout the Hockey East Tournament to net his team the trophy. If Northeastern does indeed make it to the Frozen Four and beyond, it will be because Primeau stole a handful of games. Regional tournaments be played this weekend ahead of the Frozen Four, which will take place April 11 and April 13. If the tournament ends up being half of what it promises to be, we’re in for a fun ride.